A new green initiative taking effect Saturday in British Columbia will mean residents of the province will soon say goodbye to some incandescent light bulbs. But the shift is being made despite longstanding concerns about the environmental hazards posed by the alternative — the compact fluorescent light. Somehow, I missed this one coming through here in B.C. I know it was done in the UK, but I thought, for the time being, we were some way off…. I was wrong. For reasons why this is madness, watch the following video, and don’t worry about the balaclava. He’s just shy…. For dem dat couldn’t manage da video, here are da main points….. we is gonna go from da lightbulbs that we can safely dispose of and dat pose no immediate health threat, to ones that contain mercury and could pose health issues, such as brain and kidney damage in us peeps, along with increased environmental damage such as 5mg of the stuff, the amount contained in each one of da bulbz should it not be got shot of safely, polluting 6000 gallons of water a time, you know, dat stuff wot you get out of dee tap, innit. Energy-saving light bulbs were at the centre of a fresh health scare last night after researchers claimed they can release potentially harmful amounts of mercury if broken. It added that broken bulbs posed a potential health risk to pregnant women, babies and small children. It might be wise to make sure you know what risk you’re taking with these things, wouldn’t you say? In 2010 it was transmitting water meters that will allow them to “cut you off” if you use to much along with the bins that can squeal on you if you put the wrong bit of rubbish in the wrong bin, even if you didn’t and it was some passer by, only for, in 2011, lightbulbs that could put me into a migraine at best, brain damaged at worst. Marvellous. Nothing like starting off the new year, with the blood pressure low, eh…..
UPDATE….. Should be good for a while, I’ve stocked up on the little blighters. 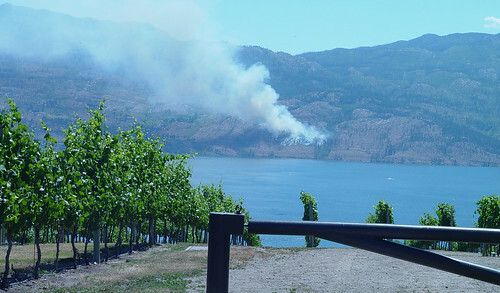 No mercury for Chateau Boom, not yet anyway…… after which we’ll be on candles…..
Two Brush Fires, in Kelowna…. So, after we had the Peachland fire a couple of days ago, an ominous plume of smoke strated rising on the horizon, on the opposite side of the lake, about half an hour ago…. Kelowna fire department and Ministry of Forests crews are at the scene of two separate brush fires near the end of Lakeshore Road at the border of Okanagan Mountain Park. Forestry has sent one attack crew and two helicopters. The fires, described as rank two out of six, were called in shortly after 1 p.m. They are in the area of the 2003 Okanagan Mountain Park Fire. The nearest home is several hundred metres away, however, residents in the area are not being allowed to access their homes. Residents that are in homes in the area are being asked to leave. RCMP have set up roadblocks on Lakeshore Road at the entrance to Bertram Creek Park. Winds in the area are relatively calm, coming out of the south at 17km/h with gusts to 37km/h. More news, as we get it….